Eliminate the need for plastic ware with this unique, eco-friendly, all-in-one utensil. Perfect for picnics, backpacking, lunch boxes and appetizers. One of our most popular items. The reusable bamboo spork is one of our all time favorite products. They are just so fun to handle, while their sleek design makes them immeasurably portable and practical. Eliminate the need for plastic ware with this unique, eco-friendly, all-in-one utensil. Perfect for picnics, backpacking, lunch boxes and appetizers. Last night we took the kids down to the beach for an end-of-summer picnic, and picnics always remind me of how much I love my reusable bamboo Spork. So I figured, what better time than now to honor and reflect on one of our all time coolest products. So simple, so functional, and so aesthetically pleasing, the reusable Spork is the epitome of sustainable simplicity. 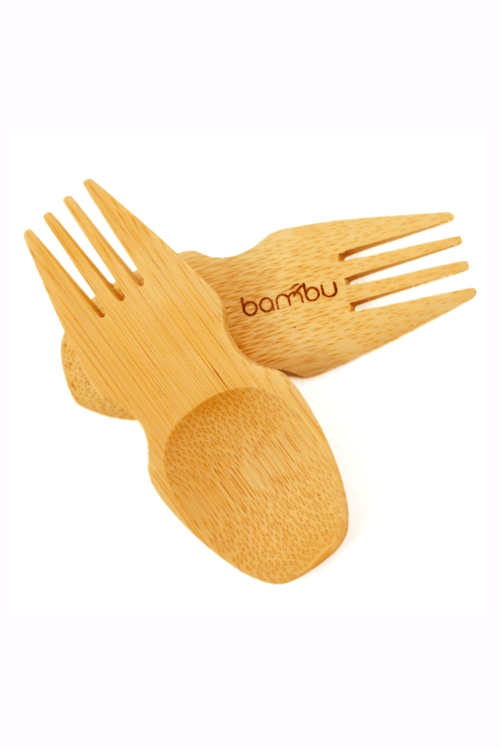 Crafted from bamboo scraps at the Bambu® factory where so many of our bamboo kitchenwares are produced, each Spork rescues a sliver of bamboo from the waste heap, and then, over the course of its long life, goes on to eliminate the need for thousands of disposable plastic utensils. With just a few basic tools, the individual scraps of bamboo are readily shaped into Sporks — no glues or wood stains required. I always keep a Spork behind my desk here Bambu Batu, and believe it or not I’ve been using the same one for about 5 years now. And the thing is good as new. Whether I’m picking up lunch from one of our cafe neighbors or bringing in some snacks from home, my trustee Spork is always here, ready to get the job done. And it didn’t take long at all to train the cafe staff NOT to put the usual plastic forks and spoons into my take-out lunch.